The Ship of Fools is the whole of mankind, sailing through the seas of time. On a ship, a small ship, a lost ship. Sadly, every one is a fool. We live for the here & now, we consume beyond reason. We waste, clear fell, erode the land, grow thirsty crops in a dry climate. Whilst living with the belief we can have it all, forever. Meanwhile our ship drifts aimlessly, never reaching harbour. As a part of a major sculptural series Ship of Fools by Collaborating Artists: Julie Collins & Derek John, 35 artists from around the world have been invited to respond to global warming. 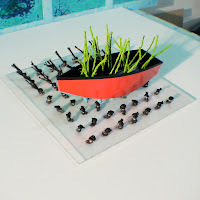 Each artist has been sent a 30cm plastic ship and must use the ship as a starting point to create a work about Climate change and Global Warming. Painters, Sculptors, Writers, Filmmakers, Photographers and Multi Media Artists will create an art work and send it back to Australia for exhibition at the Yarra Sculpture Gallery & The Ballarat Mining Exchange. An online link up with artists and visitors from across the world will take place live at the Yarra Sculpture Gallery opening. With mix of live crosses, films, digital images and comments. You can register to obtain a password to join this online forum, or just come to the opening and join in at the live site. In one place Stan Parker saw, stuck in the fork of a tree, the body of an old bearded man. But he did not mention this. He rowed. All omissions were accepted by the blunt boat. And soon the old man, whose expression had not expected much, dying upside down in a tree, was obliterated by motion and rain. The journey is complete, its success questionable. The Ship returns to the Earth. This is not an absolute argument, only a connection. 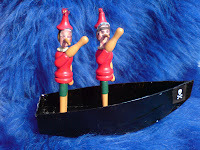 I have chosen figure to decorate my boat with female figures. Coincidentally in this case –as vessel/container/boat. connection I make here is one of exploitation. as we can, and do exploit each other. Human nature to control and gain mastery over. Vital to our very experience. look up. Do you see a Blue sky, rain clouds or smog? What would you rather have fall on your head? Fresh rain water to feed our parched Earth or some complex chemical mix that only has the potential to do something remarkable, it can make a difference for future generations. So I send this ship of Hope to you, that you take the opportunity to help make that change. Look up and if you can imagine you can see a shape of something in a cloud, that means there’s still time for the planet. If the rain stops and the plants wither from an acid lubrication then we are all in big trouble. Big is always in a world of consumer excess & waste. There is no indifference when like minded souls reach out to each other, beyond borders, politics, economics, race, religion. A virtual shift of consciousness arising from connectedness, problem solving and hope. 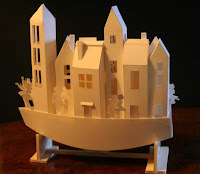 Global warming, an Intra-structure of climate change, humanity from within, a Ghost Ship of fools from a kinship of hope, that carries each and every story from our ancestors to the living moment towards the benefit and destiny of future generations. The _8_O_8_ online virtual space offers an experience where artists connect, create and interact through the shared exchange of remote audio, video and text based objects in real time. It is a new media artistic experiment that reaches out to ignite and engage remote creative resources through the synergy of the spontaneous moment. We are putting our future to the ship of fragile paper and straw.At last, we learn the fragility of the ship.Our sky is still blue, and we begin to step for tomorrow. From the gold motifs and paint, representing the precious resources we devour, to remains of ecosystems symbolised in the bird's feathersthe ship of fools careers uncontrollably through the course of time. 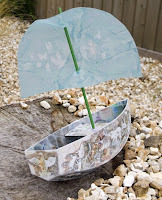 This study for a larger work would use concrete, steel, plastic coated burlap and a broom for the sail. It would be about five feet high and the paint would be deep, but translucent to allow the documents to be legible. Over the words are red, white and blue paint; the documents have been red white and blue washed. Reading them is almost impossible. This is common; long after the intellectual specifics are forgotten the words turn into emotional colorings, often having nothing in common with the ideas. The sails have become sales advertisements for selling ships, buying ships and advertising the self. This corresponds to politics, consumer economies and self-aggrandizement, all antithetical to the enlightenment, on which the USA was founded. The two great threats to the Enlightenment foundations of America are the consumer economy, which tries to manipulate the populace into profit generating rodents and the party that seeks to turn the government into a big business itself. The ship of hope is the spirit of the Enlightenment; using the mind and the self as tools to improve the world and the ship of fools is the mindless use of the power motive and the profit motive that inevitably ruin the world. This work is comprised of plaster set with water I have bathed in. A plaster slab provides the ground of the work - a dried salt bed encrusted with glimmering crystalline deposits - rather than a flowing sea. 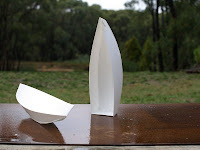 Plaster boats are cast from the original plastic boat sent to me in the mail. The body of a turtle dove, found dead in my garden, is set within the plaster of the boat with the deeper draft. I am not sure why the bird died, but as I picked it up a handful of seeds, all of the same type, fell from its gullet. Some of the seeds have now been planted. The other boats contain the remaining seeds and follow in procession. “like the eternal cooing of a dove — Cythera had become, in truth, a wretched land. These lines are lightly etched into the plaster ground as are the lines of my hair and other residues of the bath water. They become the sea for the boats which carry, in silence, the dove’s eternal song. We are amassing ALL the rubbish of the world – BE CAREFULL !!! It might sink the boat. the baggage of a previous life, be it, things, philosophies, politics, mythology or religion. Their 'boats' are often overloaded. How do they fit into a new life without discarding some of those trappings? There is always the hope that the old and the new will combine successfully because we are more than 'The sum of our parts'. During my marriage I gathered up various pieces of jewellery mostly gold as well as my wedding ring and engagement ring. The latter years of my marriage were some of the most unhappy times I have ever known. I quickly learned that possessions cannot make you happy. I have decided to show both sides on my boat. The outside shows a mouth consuming gold. Human desire, greed and indulgence are denoted by this image. Inside is an image of bubbles. Bubbles are such temporary things lasting for only a few moments. Each one is beautiful and individual with their colours, size and duration. They cost virtually nothing to make and bring such a smile to the viewers face. They remind me very much how fragile, beautiful and special life is. How it is much more rewarding than gold or silver if you can bring joy and happiness into someone’s life. Inside the buttons remind me of my children. These are little spare buttons which gathered up in my sewing box from all their baby dresses and cardigans. 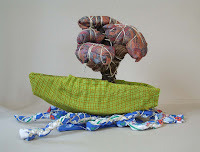 The boat has been sewn together and the buttons are suspended on threads to show the fragility of life and also how as they grow they will sail away on their own boats but I will always be connected to them. Love is greater than riches. I've always considered the Smiley faces (a.k.a. emoticons) now so ubiquitous to chat rooms to be very silly. They exhibit a hollow kind of "not-really-serious" mentality and I sadly confess that I am among the many who use them. They are most often used when one is unwilling or unable to come up with a well-considered response, or to conveniently gloss over a lack of anything of substance to impart. They are a convenient and easy fix to the vacant thought. 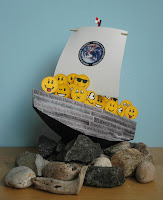 They thus seemed to evoke just the right kind of shallow sensibility to represent the fools aboard my ship.The ship is built up of headlines that I've collected concerning environmental decline. This is a ship of state, representing the sorry state of Spaceship Earth. It is on the rocks. The flag signals danger.Should I be worried? Cue the Smilies! My country is run by fools, lead by an infamous fool. Yet I remain anoptimist, which probably makes me the biggest fool in the boat. Allships bring hope. We wait by the shore expectantly; even if the tideruns red and draws up skeletons- it is always a new day. Since the time of Chaucer the motif of the Ship of Fools has explored our follies. Now as then, our readiness to indulge in violence is in the forefront of errors. Will we keep making the same tragic choices as we squander land and resources, as global warming and environmental decay create further stress and conflict. In short: will we be able to avoid catastrophe? The boat form was the template for the frame, built as a truss; the ubiquitous construction technique of our era. At its centre is a void outlined by the silhouette of a missile. Ad astra or ad bellum? How we navigate the world, cultivate the wilderness, and mark out territories for ownership, is of great interest to me. We number, chart, classify, and catalog all things, objects, land, space even people. All are measurable Soon we will be left with just symbols and signs to mark our achievements and the environment we aspire to control. Hear the laughter in the wind and the waves. There is no earth under our feet! I’m a proud conscientious consumer, thinking “green”, buying locally, supporting causes I believe in. I recycle, reuse, and reduce. I drive only when I have to and walk where I can. And yet as an artist, my ignorance is bliss. I don’t know where my canvas comes from or if the stretcher bars are harvested from a sustainable source. Where does my beloved quinacridone pigment come from? Who makes the paper I happily rip up? How are my brushes produced and how are synthetic bristles made? Dare I spread an environmental message with questionable materials? Am I foolishly hopeful? I work across media in textiles, painting, drawing and installation, responding to social and political themes from a personal viewpoint. 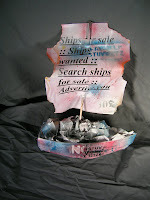 I play with text, image and found materials to create pieces that have an ‘authenticity’. Often my work has a narrative content, sometimes emotional, sometimes a little twisted. 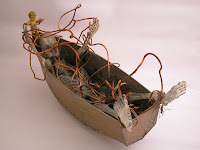 My ‘Ship of Fools’ is a military camouflage boat, lined in red silk and manned by a crew of floppy, battered, saluting, camouflaged rabbits The sail is a series of stitched slide films from a military safety presentation that turned up on a trawl through a skip. 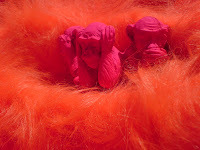 These monkeys stand not for wisdom. These ones stand for the greedy super rich society, which is blind, deaf and dump to the poverty in the world. They sit comfortable and ignorant in the fancy dreaming ship of fools. The only thing in their mind is to realize even more greed, thinking this should be our future. This piece depicts what we perceive as our current state of madness: the ship cuts through a sea rendered dangerously useless by fools, yet as it glides past new life emerges from within its hull. Will these new generations maintain their vigour and reverse the trend? It's obvious to see that my ship is a ship of fools. You can see it on both men in the ship they are stupid as hell. 2)pigments in order to create. 3)Water as source of life. 4)cutting as source of hope. My ship belongs to you. It is you to tell your own story. No one could have imagined what the industrial revolution of the late 18th century and the early 19th century would bring. And what the scientists, inventors and engineers since would give us in technological advances beyond anyone’s dreams. The invention of the cotton mill, the steam engine and iron founding marked a major turning point in human social history, which influenced everybody eventually. However, could this have been seen as the beginning of the end? In the 21st century we enjoy the benefits of progress and innovation, but have we gone too far? The globe has a sickness; due to human excess, untreated it will only get worse. Science and innovation has brought us to this point, and now we must put our faith and support in those same professions, to find us a solution. We are no longer in a position to ignore the facts. And maybe we should look at this time with excitement, as an Environmental Revolution, an era which will be recognised as a turning point. As Artists we believe we have a responsibility to help raise awareness of issues of global warming, it’s causes and effects, challenging all, to view things differently, if only, for that brief moment of visual contact, and ask the questions. What is your position in the world, what affect do you have on it, and what can you do about it? An ambitious aspiration on our part perhaps, but we believe the time for art referencing it’s self and exploring form alone, with no conceptual commentary is over, at least for us, it is. Time is running out, artists must take the lead, help reach new audiences, address the way we live. Artists must be informed and inform. It is only when everyone is sailing in the same direction that the tide will turn; and then governments, business and the general population will see the urgency and only then our ship may just reach harbour after all. Whether it is a subtle or heavy handed approach the artist has a powerful tool to relate these issues in many different forms. We are all media tired; many sit and watch the nightly news though can’t remember the last item which was on. Yes we can stream, pod cast, download, surf, listen, read & get the same, or a difference of opinion anywhere, but is that all too much, are we in overload? We need to seek another avenue to educate. As artists we need to take responsibility and join others in the task of turning the tide. Art can play apart in the solution. What is the Ship of Fools? It is commonly thought that the first known direct reference to the Ship of Fools was in 1494 when Sebastian Brant, a German theologian published a satire in Basel, Switzerland. Ship of Fools (Narrenschiff) is believed to be influenced by Plato’s ‘Allegory of the Cave’ and the madness of confirmed space and may refer to However it was Brant who consolidated the Ship of Fools as an entity in itself, creating a vehicle of which many have since ridden. This publication comprises of a series of 114 brief satires, and was illustrated by woodcuts, including many by the important Renaissance artist Albrecht Durer. The usually conservative Brant used this publication to be critical of the Church and unleashes his humorous venom against the perceived weakness and vices of the society of his time. This work became extremely popular with the masses and was taken on board by the reformation movement, which eventually split the Catholic Church and gave rise to the Lutheran Church in Europe, although Brant himself did not support reform. The reformation movement called for change and saw the current state of the church as a ship of fools, this document helped give the movement a focus, a somewhat clever marketing edge, text and illustrations in jest being fair more effective than dry facts, as the book was written in the voice of the fool, where anything could be said under the veil of foolishness and insanity. Since Brant, artist, writers and musicians have used the Ship of Fools as a soapbox to highlight the excesses, decline or political direction of their time. Our journey continues in 2008.